I love Valentine’s Day. Not that I love the commercialization of it – I hate the commercialization of everything. But as I like to blog here every year, Valentine’s Day marks the start of this family and so therefore, it must be noted in some fashion. Nothing big and splashy of course – just a wee something. Keeping with my love of handmade gifts, I started making these treats for my valentines a few years ago. They are quick, easy and yummy – my holy trinity. The original recipe came from a post on Design*Sponge, but I’ve altered it over the years to be the one I’m about to share with you, so I’m not linking to the original. 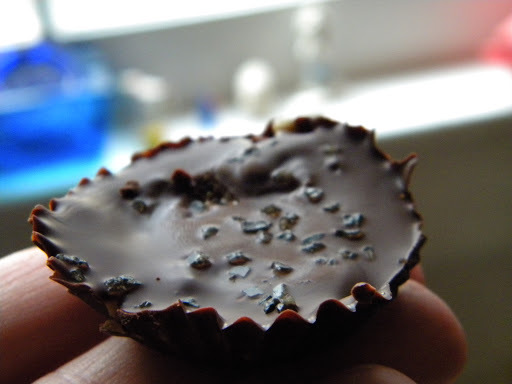 If you can melt chocolate, you can make these. They are that easy. 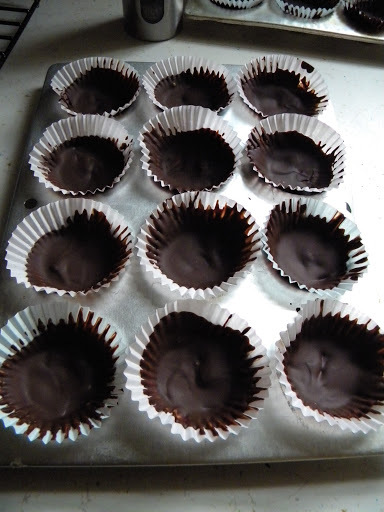 A few notes – I use good dark chocolate and natural peanut butter. The original recipe calls for crushed graham crackers and salt to be added to the peanut butter mix, but I find it’s not necessary. 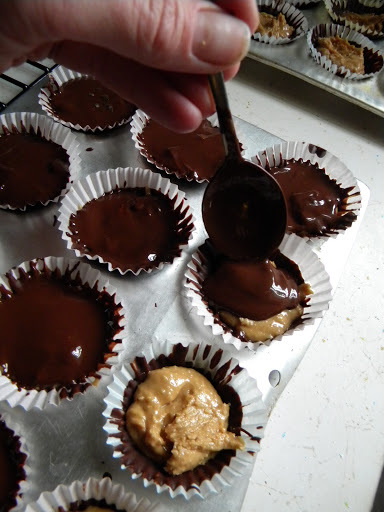 I make them in mini-muffin tins, as I find a full size muffin tin peanut butter cup to be a little too much. 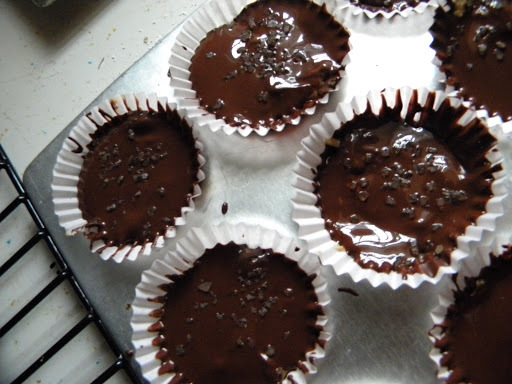 Using a spoon, spread melted chocolate on the bottom and sides of paper muffin liners. Coat them generously – this is the bottom and sides of your candies. Chill in fridge for 10-20 minutes or until hardened. Combine peanut butter with sugar. 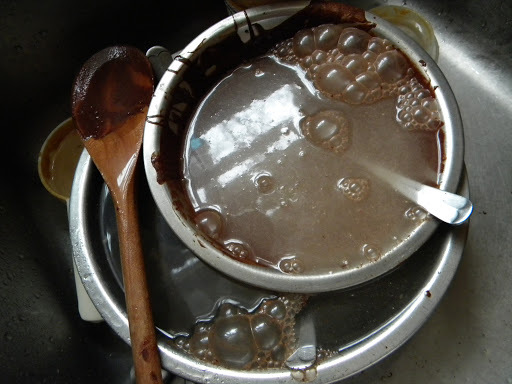 Melt remaining chocolate. 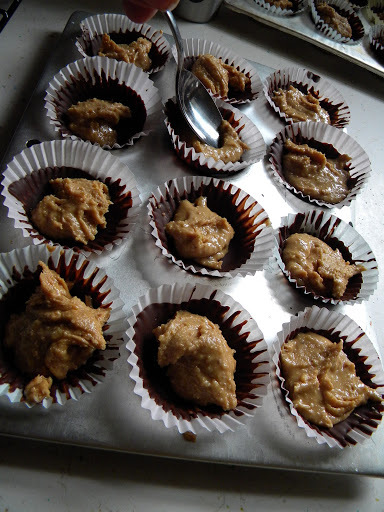 Place peanut butter in each muffin cup. I like to spread it out a bit with the back of a spoon. 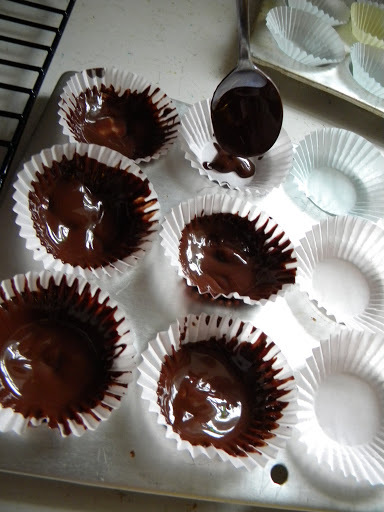 Dollop melted chocolate on top of the peanut butter, using a spoon to smooth out the tops. Refrigerate for about a half hour or until fully hardened. Sometimes I get jiggy with it and sprinkle sea salt on top. Today I used bamboo salt. Because it was the first jar I grabbed when I opened the spice cabinet, that’s why. This is what is left to clean up. If you can melt chocolate, you can make these. And your valentines will thank you for them. This recipe is going to be so popular with the little nieces and nephews, and their parents! Yummy and easy…oh, I like! Sea salt–I like how you get jiggy!